The most innovative design feature of this backpack is the bottom section is actually a beltpack that can rotate around to allow easy access to your gear without taking off the bag—perfect for quick lens changes. I’ve been testing the Rotation 360 since January, and rotation feature works quite well. Once you’ve tried this bag, you’ll notice how many times you set your regular backpack down in the course of a shoot to access your gear. Speaking of setting your bag down, the Rotation 360 stands up straight because the bottom of the backpack frame is completely flat. My other backpacks have a propensity to topple over into the dirt, so I really appreciate this feature. The ergonomic carrying handle on the top of the bag is also nicely designed. The materials and zippers on the Rotation 360 are high quality, and the straps are comfortable and easy to adjust. The placement of the padding that rests against your back is designed for ventilation. The belt strap attaches to the right of center, which keeps the clips from rubbing. I’ve been on multiple 4–5 hour adventures using the Think Tank 360, and it's quite comfortable. The bag includes a basic camera strap with metal loops that attach to a clip on the backpack's shoulder straps. The clips are easy to connect, height adjustable, and store away neatly when not in use. This innovative strap system really takes the weight off your neck, and also helps comfortably distribute the load by moving some weight to the front. 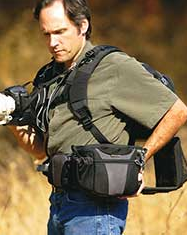 A standard sized tripod can be carried by putting two legs into a pocket on the outside of the lower backpack compartment and securing it with a strap at the top. For a more balanced load when carrying large tripods there is a hidden fold-down pouch on the bottom of the bag. The Rotation 360 holds 1–2 camera bodies, 2–3 lenses, flash, and accessories. You can attach additional Think Tank modulus components to the waistbelt for quick access, or to the upper part of the bag. If you normally shoot with a standard zoom but occasionally need quick access to a telephoto, you can mount a lens changer on the belt. Or keep your lenses in the bag and use the space for a Lightning Fast flash pouch, or R U Thirsty water bottle holder. Having a medium sized backpack that’s expandable is a good way to have a lot of flexibility when packing your gear. In case you couldn’t tell already, I am a big fan of the Rotation 360—it’s a versatile, thoughtfully designed bag. Innovative design and quality materials do not come cheap. The Rotation 360 retails for $279. There are certainly other camera backpack options in this size range for half the price. The quick access, comfort, and long list of useful design features make the Rotation 360 well worth the price. I’ll be getting rid of a couple of my current bags, and using the Rotation 360 instead. Having one bag you really like means less time spent packing gear, and more time shooting—and that's a worthwhile investment. To see the Rotation 360 in action, check out the product information including photos and videos. You can read a longer, more complete version of this review at my website. It looks good if you feel comfortable walking with your camera out and exposed, but I think I would prefer the Lowe approach. Especially considering the Lowe's ability to rest your elbows on the pack for steadying your shot. I agree that having one great bag is well worth the price. This particular sack is overkill for my style of shooting, but if you move with a lot of gear it looks like a winner. Nice summary/review, Joe. Think Tank has placed itself squarely in the vanguard of innovative camera bag designs for the past year or so. The "Rotation 360" is a prime example of their creative energy. I think LowePro has become complacent in recent years and deserves to face a strong upstart like Think Tank. Personally, I try to carry as little as possible when shooting outdoors. I've not yet purchased any Think Tank gear but have more than my share of LowePro and Billingham. (There's something about camera bags that must be like womens' shoes...) I've found that the less I schlep the better my images. I typically bring 2 bodies, 3 lenses, and some flash gear to most shoots -- so this bag works really well for my standard kit. Photo backpacks that carry a laptop tend to be too big and bulky for me -- I prefer to carry a separate bag for the laptop when I need it. If I'm shooting casually with 1 body and 1-2 lenses, I either use a messenger bag or Domke F3-XB.